Photo 10. The beautiful, heavily wooded side valley of the Afon Clywedog drains eastwards from the Denbigh Moors and joins the much larger, north-south oriented Clwyd Valley near the village of Rhewl, just north of Ruthin. The river bed cuts through some striking rock scenery. The cliff in the photo above, although located on the eastern flank of the Denbigh Moors, is not made of Silurian turbidites, like most of the moors, and the Clwydian Range on the eastern side of the Clwyd Valley, it is formed of shallow marine Lower Carboniferous limestone which dip at 10 to 20 degrees to the east-north-east, i.e. into the Clwyd Valley half-graben. This is because the extensional down-faulting of the main Clwyd Valley ‘half-graben’ has protected and preserved these younger rocks which were deposited long after the Silurian turbidites were laid down in the deep marine environment of the Denbigh Trough. Photo 11. 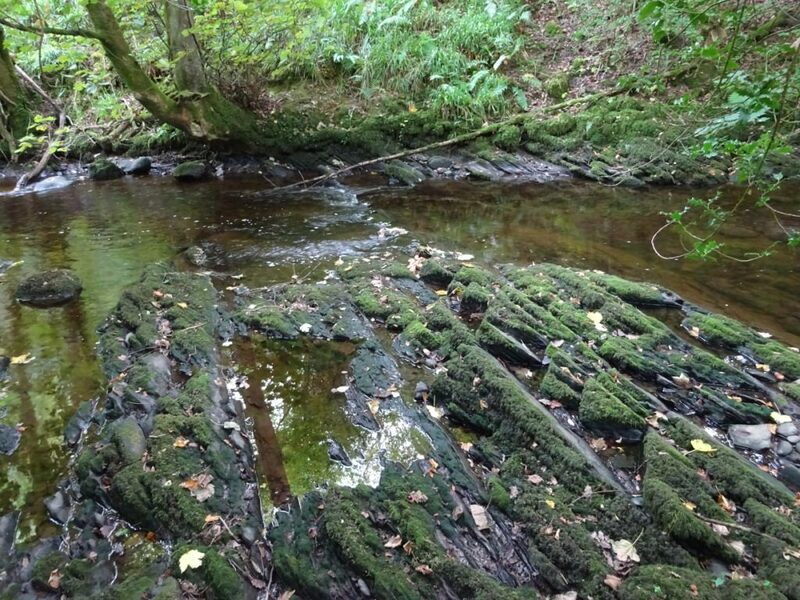 Further west, higher up the Clywedog valley, the rocks in the river bed suddenly change back to steeply west dipping Silurian turbidites typical of the Denbigh Moors. This is because we have crossed an unconformity. The much younger, shallow marine Carboniferous limestones have either been eroded away here, or may never have been deposited. Photo 12. 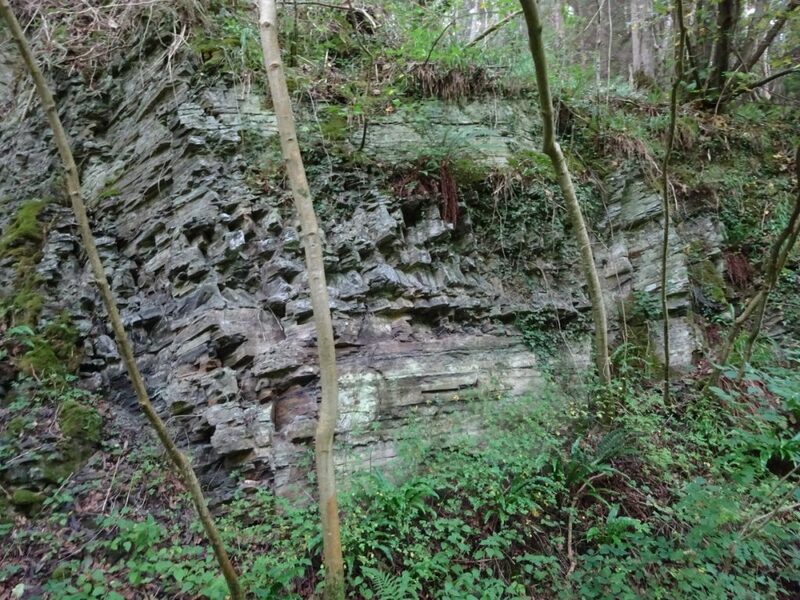 Another outcrop of Silurian turbidites in the upper Clywedog Valley. Here the lower and upper layers are normally bedded siltstones, but the middle layer is internally deformed, consisting of slumped and disturbed units, structures and lithologies often found in turbidite sediments.